Fr. Ranhilio Callagan Aquino, Dean of San Beda University Graduate School of Law, in his Facebook account, said that Senator Francis Pangilinan does not lack the brains, but he is defending a losing argument, in reaction to the recent Senate deliberation on issuing a resolution to question the ouster of the Supreme Court Chief Justice. In the recent deliberation, only 14 out of the 23-member Senate body signed the resolution to question the Supreme Court's decision to oust its own CJ, Lourdes Sereno, through a quo warranto proceeding. Under the Constitution, the Chief Justice can be removed only by impeachment. The court's decision gained several criticisms, and debates among citizens and law experts alike. One of the law practitioners who were for the quo warranto ouster is Aquino. "PANGILINAN IS BY NO MEANS DULL-WITTED. So why did Ping Lacson beat him to pulp at the interpellation -- in Ping's own non-abrasive way? SIMPLE, actually. Pangilinan was defending an INDEFENSIBLE position," he said. "It was much the same case with those who hurled every possible slur at me when I argued in favor of Quo Warranto...they were clinging vainly to an untenable position,"he added. During the deliberations for the resolution, Lacson and Pangilinan entered into a verbal clash, when the latter presented Resolution no 738 for resolution. Lacson said that the resolution is a legislative encroachment on the power of the judiciary. “Right now, there’s a motion for reconsideration before the Supreme Court. Right now, there’s still a chance that they may correct,” Pangilinan said. “So that’s the intent of the resolution? To influence the Supreme Court? To reverse its decision?” asked Lacson. “It is to seek the Supreme Court’s reconsideration…” Pangilinan said. “But that’s the intention as you’ve mentioned. 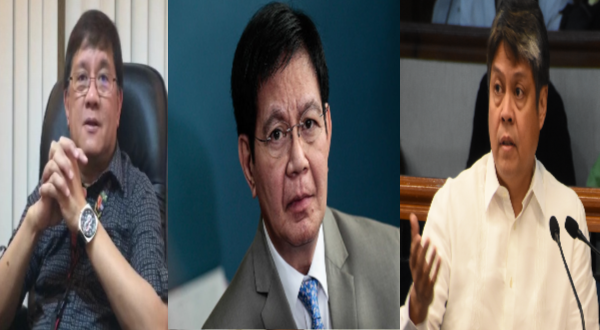 We are trying to adopt this resolution to influence the Supreme Court to reverse its decision because as you said, there’s still a motion for reconsideration so there’s still a chance that the Supreme Court may reverse its decision and that’s the intention of this resolution,” Lacson said. “Is it not encroaching on the powers of the Supreme Court that has acquired original jurisdiction over the quo warranto petition?” he then asked. Pangilinan merely repeated that the resolution was a way of the Senate of upholding and defending its exclusive power to remove impeachable officers like Sereno. Pangilinan said that Sereno’s removal via quo warranto was unconstitutional. “But who interprets the Constitution? Is it the Senate?” Lacson asked again. Lacson said that he was standing on his ground, and arguing, in the hopes that some of his colleagues who signed the resolution, would withdraw. In an earlier interview, Aquino explained that Sereno's ouster is not the end for her, as it rooted from quo warranto proceeding. She can go back to private practice and can even be reappointed to a government position. "As long as the defect (to the appointment) is cured, there should be no objection to the reappointment," he explained. "As long as the defect in the appointment is something that can be remedied or cured, why not? There's no objection." Whereas, if she was impeached, Sereno will be banned from public office and would not be allowed to go back to court. The proceeding was initiated by Solicitor General Jose Calida who sought to nullify Sereno's appointment, saying she was "unlawfully holding" office due to her alleged failure to submit all her Statements of Assets Liabilities and Net worth (SALNs) when she applied for her post, as required by the rules.